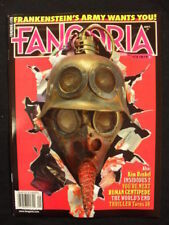 6 ORIGINAL VINTAGE FANGORIA MAGAZINES. # 45, 46, 47, 52, 56, 58. 1985 & 1986. # 45, 1985, 46, 1985, 47, 1985, 52, 1986, 56, 1986, 58, 1986. If you're after zombies, werewolves, ghosts, ghouls and vampires, this is the place to find them. 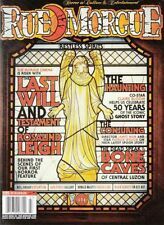 And also hit the sets of Ti West’s THE INNKEEPERS and Steve Niles’ REMAINS, plus much more! 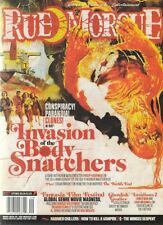 This issue sports our first (almost) all black-and-white cover, in honor of a major retrospective interview with genre legend Roger Corman within its pages. Freddy's Nightmares No2 1992 Scarce. say hello to the nightmares. Freddy's Nightmares! "Freddy's Dead: The Final Nightmare ". adaptation of the sixth Freddy movie. Published by Trident Comics in 1992. "No 7 SEPTEMBER 1995". MAGAZINE IS IN VF / VFN CONDITION. WITH FREE UK P/P. Featuring - Christopher Lee's Dracula on the cover. Issue 308 Nov 2011. 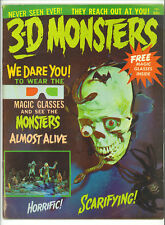 "FAMOUS MONSTERS OF FILMLAND MAGAZINE". HORROR MAGAZINES. "WHY WE LOVE HORROR MOVIES ". ISSUE No 225 DATED; MARCH/APRIL 1999. Magazine is used in vfn condition. FOR SALE IS A BACK ISSUE. (small sticker mark on top/right). PREMIERE ISH OF THIS RARE 80’S UK HORROR FANZINE. Nice flat copy, good as new - see visual. "Exactly as described. Buy without hesitation". - tarot0476 (UK). ACE New Comics 2009 Repumped. (Creature, Phantom). Similar in look to Famous Monsters. CENTS COVER PRICED issue from 1964. GREAT COVER AND A REALLY SCARCE ITEM. £4.60, depending upon your location. Includes 10 pages of 3-D photos - of what look. ACE New Comics 2009 Repumped. and either checking out or requesting an invoice. "THE CURSE OF THE MUMMY'S SHROUD". "No 3 MAY 1995". MAGAZINE IS IN VF / VFN CONDITION. WITH FREE UK P/P. (very, very light spine stress). "A TASTE OF BLOOD / DRACULA RISES FROM THE GRAVE". "No 6 AUGUST 1995". MAGAZINE IS IN VF / VFN CONDITION. WITH FREE UK P/P. And either checking out or requesting an invoice. FANGORIA MAGAZINE #312 INTERVIEWS! HORROR! FANGORIA MAGAZINE #312 INTERVIEWS! Price : 4.35. DIABOLIQUE MAGAZINE #8 JAN/FEB '12 HORROR! WOMAN IN BLACK! DIABOLIQUE MAGAZINE #8 JAN/FEB '12 HORROR! WOMAN IN BLACK! Price : 6.45. The magazine is used and in FN condition. made with love by. UK - Free. "No 5 JULY 1995". "FRANKENSTEIN CREATED WOMAN". MAGAZINE IS IN VF / VFN CONDITION. WITH FREE UK P/P. "RASPUTIN THE MAD MONK". "No 4 JUNE 1995". MAGAZINE IS IN VF / VFN CONDITION. WITH FREE UK P/P. ACE Comics - ACE Comics - ACE Comics. and either checking out or requesting an invoice. The magazine is used and in VG condition. made with love by. UK - Free. USED BUT IN GOOD CONDITION, HAS A STICKER STUCK ON IT.